Parent Trust can be a parent’s best friend. Parenting is hard work. We know so we equip families with effective and practical, research-based knowledge and tools to confidently raise their kids to be safe, healthy, and resilient. From conception to college, our continuum of programs and services provide support to 15,000 family members every year. The women and men of Parent Trust’s Board of Directors lend their passion, skills, expertise, and connections to help expanding and scale our impact. The board is a mission-driven, volunteer body that provides strategic leadership, secures funding, sets goals and policies, and ensures that Parent Trust operates legally, ethically and effectively. The Board’s policies provide the blueprint for our Executive Director in managing the agency’s business affairs, staff and volunteers. Commit to a three-year board term. Serve on one Board committee and carry out related responsibilities. Understand and commit to Parent Trust’s mission, services, programs, and policies. Make Parent Trust a "Top 3" philanthropic priority, including an annual gift that is personally significant reflecting that priority. Actively participate in fund development initiatives, including personal outreach and events. Be a Parent Trust ambassador and make warm introductions between Parent Trust with friends, associates and community leaders. Recommend board and committee members. Follow all conflict of interest, ethics and confidentiality guidelines. What do I bring to Parent Trust? A passion for and commitment to the Parent Trust’s vision, mission and goals to build strong families and keep kids safe. Demonstrated track record of working in or directing teams. Experience in a relevant area such as non-profit governance, fundraising, advocacy, strategic planning, organizational development, change/growth management, program development, finance and/or accounting, and law. Prior board experience is highly desirable. 2 hours to prepare for and attend a Board meeting (10 per year). 2-3 hours for committee work (per committee). 1-3 hours for special tasks, meetings, introductions to community leaders, events and fund development activities. Community roots with solid network of friends, business associates, and others. Able to reach out to, introduce and engage contacts with Parent Trust through social and event opportunities. Expected fund development activities include: sourcing and cultivating major donors prospects and corporate partners, recruitment of Luncheon guests to help support families and kids, participation in organizational cultivation and stewardship activities. Board Members commit to making Parent Trust one of their "Top 3" giving priorities. Parent Trust expects 100 percent of its Board Members to make an annual contribution commensurate with their giving capacity in order to credibly solicit contributions from foundations, organizations, corporate sponsors, and individual donors. Members also purchase a $500 table for our annual luncheon for themselves and 9 guests. Members can give annually, quarterly or monthly. What does Board service mean for me and my community? There are few investments in life more important than making sure families have the tools and support they need to raise safe, healthy, and resilient children. And there are few experiences in life more rewarding than committing to Board service in ways that are meaningful, purposeful and reflective of you, your passion, and your values. During the first year, new members receive orientation and trainings centered on Board roles and responsibilities, Parent Trust’s mission, programs and history, fiduciary responsibilities, nonprofit finance, the Board member’s central role in fundraising, and leadership coaching. 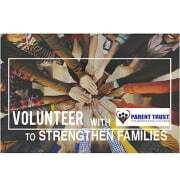 Turn your passion strong families and healthy kids into action by joining Parent Trust’s Board of Directors. Learn more by contacting ipaige@parenttrust.org. Parent Trust for Washington Children is a statewide families services agency; applicants must be a Washington State resident. *Hourly commitment may vary by month, depending on committee, projects and events. The drive and passion to improve the lives of Washington's children and families.